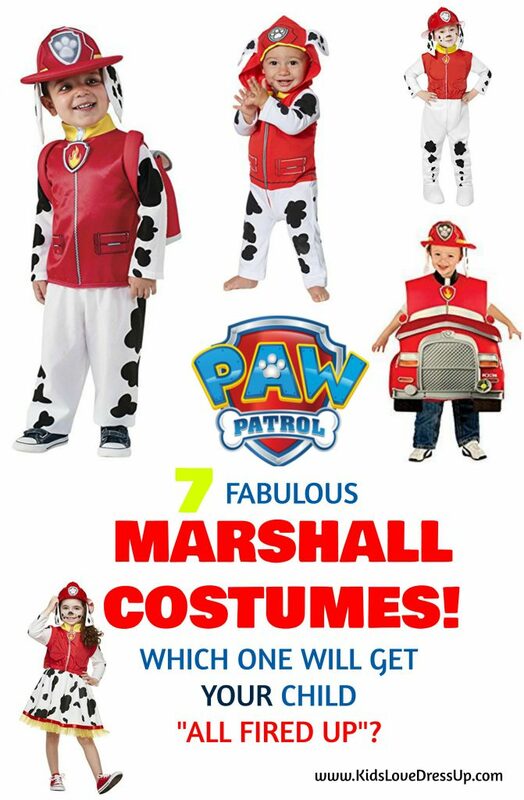 Marshall PAW Patrol Costume Options: Pick Out Your Favorite! PAW Patrol: It’s arguably one of the most popular kids shows on TV (and Netflix!!) right now! And one of the most well-loved characters on the show is the Dalmatian pup whose name is Marshall. 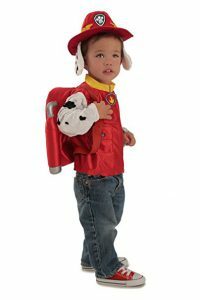 Today we’ll take a look at some of the fabulous Marshall PAW Patrol costumes available online for your pup-loving little one! But first… What is PAW Patrol? Ok, there’s a SLIGHT chance that you aren’t familiar with PAW Patrol. (That would only mean you are not a parent of a child aged 2-? right now. Possibly a grandparent or Aunt/Uncle?) 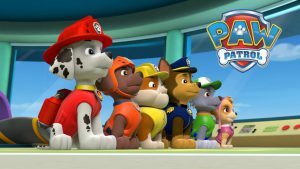 Anyhow, PAW Patrol is a show about a tech-savvy 10 year old boy named Ryder who adopts and trains a group of 6 (eventually 8) talented pups to become the PAW Patrol – a rescue squad that saves the residents (both human and other-wise) of the town of Adventure Bay from whatever sorts of challenges come it’s way. A call for help comes, Ryder devises a plan of action, and then performs a rescue mission with the help of some or all of the pups. The show is very cute, and there isn’t much to criticize from a parent’s point of view. The language is clean, the themes age appropriate for kids, the characters cute and unique, and the episode story lines fun. 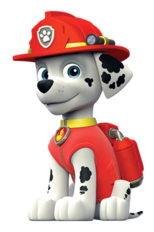 Marshall, the Dalmatian pup, is the group’s Fire Pup, meaning, his “special talent” is fighting and preventing fires. He also serves as the group’s medic pup. He drives a fire truck, and uses his ladder for high rescues, and his pup pack holds water cannons that douse flames anywhere. Ready for a Ruff-Ruff Rescue? Here Are 7 Great Marshall PAW Patrol Costume Options! Also by Rubie’s costumes, this fun costume is for kids who want to stand out a bit from the others. 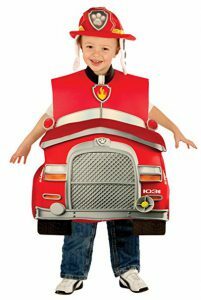 This is a 3D costume, meaning the fire truck actually sticks out in the front and back. The front actually turns into a pouch that can double as a candy bag while trick or treating! Currently rated 4.7 / 5 stars by 16 reviewers! Reading through the reviews for you, I noticed that it seems like it runs a bit on the big side – just a head’s up. This is another 3D Marshall costume option, but there are mixed reviews. The fire truck isn’t all that 3D, some write… it’s the shading that makes it look so. 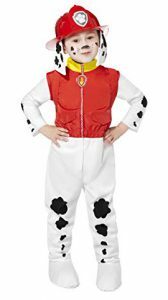 Another “complaint” is that other than the Dalmatian ears and the PAW Patrol badge, there isn’t much in this costume to make the child look like a puppy. That being said, the art design on the fire truck, front and back, is fabulous! Perhaps if your child is more excited about fire trucks than about Marshall himself, you may have a winner here! 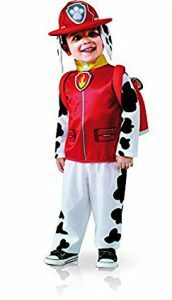 If you’re looking for an officially licenced costume for a child who doesn’t enjoy being fully suited up in a jumpsuit, here’s a great option! This Marshall set comes with the printed costume jacket (red vest and pup-print arms), functional costume backpack, and fire hat with floppy attached ears. Looking for a feminine twist on Marshall the Fire Pup? Look no further for your Marshall-loving little gal. 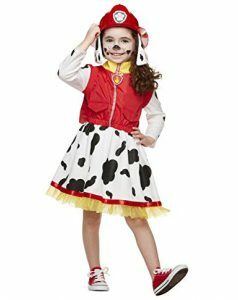 She’ll be the cutest fire pup around in this Dalmatian print full skirted dress, backpack, and floppy-eared-fire-hat costume set! Here’s another option for you… this one again, not as highly reviewed as others above, but cute and very much “Marshall”. It’s a plush microfiber jumpsuit style costume with an attached tail, attached boot tops, and collar. The fire hat with attached ears is made of a simple plastic, and there is also an included Pup Pack. The negative reviews were regarding missing ears, and wrong sizes… but there were also several positive “loved this costume” comments. Check it out for yourself by clicking through. Ok – can you get any cuter than this baby Marshall PAW Patrol costume? It’s a comfy jumpsuit style zip up… the design is printed right in, so it’s a one piece. Click through to see other pics of this one… on the back is drawn on the pup pack and the tail, and the hood has attached floppy ears! So cute! It comes in 3 sizes: 6-12 months (approx. 13-23.5lbs), 12-18 months (21-26.5lbs), and 18-24month (26.5-30lbs). A super cute option for your little guy or girl! 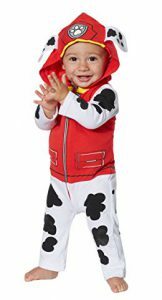 And there you go… 7 adorable Marshall PAW Patrol Costume options! Personally, I’d go with the first one, by Rubie’s. If you’re going to buy any of the costumes though, no doubt you will have one excited little Pup on your hands as soon as he or she sees it! Are you “all fired up” too? PAW Patrol… we’re on a roll! Let me know which one is YOUR favorite! And which pup you’d like to see featured next in the comments below! I love the ones with the attached firetrucks! Paw Patrol is extremely popular – I have a 3 year old nephew who is obsessed with it and even my 7 year old daughter still likes it somewhat. Can’t go wrong at all buying something Paw Patrol for that age demo. Hi Bill, Thanks for commenting! I like the 3D ones too… they’ll really make the child wearing it stand-out-from-the-crowd!